Coudy Binta De's eyes light up when she talks about how she first became fascinated with computers. The 24-year-old says that as a young girl she went to visit her mother in work at one of the Senegalese government's first computer departments. "Seeing those big computers, with their black screens and green text, was just amazing for me," says Ms De, who was inspired to grow up and become a computer engineer in Senegal. With women holding less than 30% of information technology (IT) sector jobs around the world, encouraging and helping more people like Ms De get work in the industry has long been an aim for policymakers and equality campaigners alike. And perhaps unsurprisingly, the percentage of women working in IT across Africa is even lower than the global average. In Senegal itself recent data is hard to come by, but a report published in 2009 by the International Youth Foundation said women held only 35% of IT jobs in the country. To help boost the number of women in Senegal's IT sector, Ms De and three fellow female computer engineers have decided to take matters into their own hands, and set up the country's first technology hub run by and for women. The centre is based near a busy junction in Sacre Coeur, a middle-class suburb of the capital Dakar. It has been named Jjiguene Tech Hub - Jjiguene meaning "woman" in Wolof, the most widely spoken language in Senegal. At the hub its earnest residents, predominantly women in their 20s, have spread themselves across five sparsely furnished rooms. Bright brainstorm doodles drawn on white sketchpads add a bit of colour to the walls. Some of the women are there to learn, while others are working on their own entrepreneurial ideas. "We want to be a role model for girls and for women in tech. They think it's just for men," says 26-year-old Awa Caba, another co-founder of the hub, and a specialist app designer. Ms Caba and her colleagues at Jjiguene run training courses, not just for women who come to the hub, but also at elementary and secondary schools around the country. The training they offer ranges from a basic introduction to IT, such as using programmes like Microsoft's Word and Outlook, to computer coding with languages such as HTML and CSS. At present the hub offers all its services for free. It is able to do so thanks to sponsorship, both from local businesses and US giant Microsoft, which has an office in Dakar. Microsoft has had a presence in Senegal for a number of years, as have other global IT firms such as IBM and SAP. The fact that they all have offices in the country is indicative of how successful the IT sector is in Senegal. According to a 2013 study by the McKinsey Global Institute think tank, internet-facilitated business contributed 3.3% of Senegal's gross domestic product (GDP) - the highest level for any African nation - with Kenya in second place on 2.9%. One of the youngest students at the hub is 18-year-old Kate Manon Sio, who is just out of school, and now considering her different options for a university degree. Ms Sio joined the hub reluctantly, her original plan was to study languages or communication, but it seems that she is on track to become a tech convert. "Initially I wasn't excited about it, but I changed my mind because I realised that technology is very, very interesting, particularly for girls," says Ms Sio, who has learned coding since joining Jjiguene Tech Hub. "Before, I didn't have the opportunity to talk with girls and women involved in this field. Even though I use technology and a computer, I thought it was for men," she adds. Even though the focus of the hub is on women, a few men have managed to sneak in. One of them is Ismayla Ba, a 58-year-old businessman, whose IT company Oasis Media Group provided the initial outside financial support for the centre. "I wanted to support these young women and their project. It's important. And why not work together?" says Mr Ba, who now shares office space at the hub. "They really need to be encouraged. I think in general women are much more serious and rigorous than men when it comes to work - in many domains, not just in technology," he says. To further help the young women who use Jjiguene's service to go on to thrive in Senegal's IT sector, the staff also provide coaching in being confident. Aminata Balde, a 22-year-old student of telecommunications, who regularly attends the centre, says: "Here at the hub they have really pushed me. I learned how to be confident as a girl. [Before] I was always afraid to express myself or to handle stuff." Such has been the popularity of the hub that the number of women attending on a regular basis has grown from four to 65 in under two years. 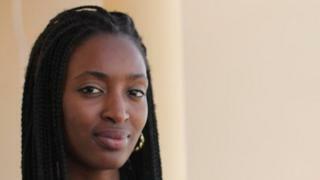 Ms De says: "All the success stories [in Senegal's IT sector] have been about men. "But we have always known that there are a lot of women who are perfect [for the industry]."